Interview by Lori Bizzoco. Written by Shannon Seibert. It looks like Jagger has some moves! Last Monday, Antonio Sabato Jr. captivated the audience with his first dance on ABC’s hit show Dancing With the Stars. The former General Hospital star kicked off season 19 with a fiery Cha-Cha. Sabato and partner Cheryl Burke were criticized by the judges for his lack of “hip action” and scored a lackluster 25 out of 40. In our celebrity interview, we asked him a few questions about his first week on the dance floor as well as his new home improvement series Fix It or Finish It. 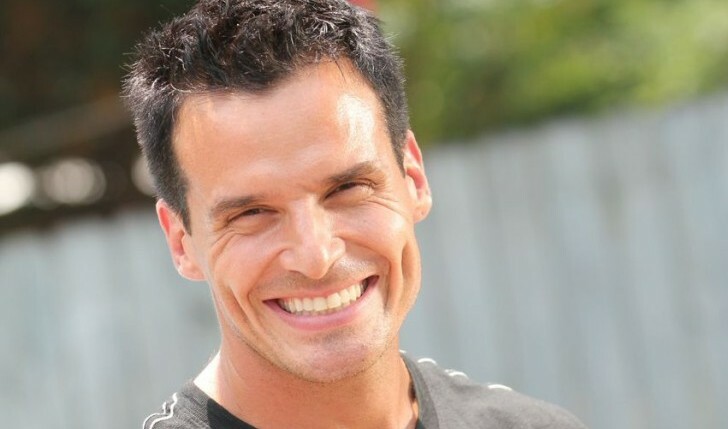 Related Link: ‘DWTS’ Contestant Antonio Sabato Jr. Reveals His First Dance: The Cha-Cha! How did you feel about your Cha-Cha and about being the first one to go out on the floor? ASJ: I thought it went well. When you’re out there in front of an audience, the energy is amazing. You can’t help but turn the perfomanace up a notch. Going first is challenging — it’s all over before you know it! We hear you are doing the Rumba on tonight’s show. What techniques or strategies are you and Cheryl working on to help you loosen up a little more? The chemistry is great, so that’s an amazing start! ASJ: I’m just trying to relax and be in the moment and let the steps come naturally. I do everything that Cheryl tells me to! We see that you visited Mario Lopez the other day. Did he give you any tips or secrets based on his experience on DWTS? ASJ: No secrets — he just told me to have fun. Lastly, how are things going with Fix It and Finish It? ASJ: Fantastically! The ratings have been really good, and we just found out that Rive Gauche has picked up the show to sell it internationally. It’s a great experience, and I love that I get to help people every single day. Follow Antonio Sabato Jr. on Twitter @antoniosabatojr. Watch the actor on Dancing with the Stars on Mondays on ABC at 8/7c!